Noah was a man who found grace among a grace-less population. The age in which he lived is described as one when every imagination of every heart was only “evil continually” (see Genesis 6:5). Violence dominated human society. Bloodshed was common and celebrated it seems. We read of a man Lamech who made up a song about his killing prowess and sang it to his wives: “I have killed a man for wounding me, a young man for striking me. …” (Genesis 4:23). Grieved, the Lord determined to “blot out man whom I have created from the face of the land. …” The earth needed a thorough cleansing, a refreshment and renewal. Human practices so violated the design of God that even most mammals, birds, and creeping things were designated for destruction. Think of the heart of God at this point. Consider the sorrow and hurt that must have touched Him. His purposes involved making beings with the power to choose. And with that power they decided to turn from Him and His ways. A third of the angels followed Lucifer in his rebellion. A perfect, wise, and talented angel turned against the One who gave him his perfection, his mind, and his abilities. The Lord formed man from the dust and quickened him to life with His very breath. Men and women multiplied as God has told them to do, but along with that multiplication grew a propensity with them toward deeper and deeper sin. Adam and Eve took the first bites from the fruit of the Tree of the Knowledge of Good and Evil in Genesis 3. Their descendants swallowed more and more of what that tree had to offer. They imagined vain things and raged against each other (Psalm 2). The results reached far – even beyond what had happened with the angels. Among the hosts of these creatures, the Lord could count two-thirds, a majority, on His side. On earth, almost all seemed gone. Was there any among the millions upon the planet walking with God? “But Noah” — just one man, a solitary father with a small family –“found grace in the eyes of the Lord.” From this man, God would start again. The Lord told Noah the truth. The sins of man stunk, and their smell had reached high into heaven. A drastic measure was necessary now. The waters were coming, a flood would swamp all the land, even the highest of mountains and wash away the results of wickedness. God’s plan required Noah’s obedience. He and his family would not be transported away as Enoch had been. This one man was given a plan and instructed in the way of salvation. 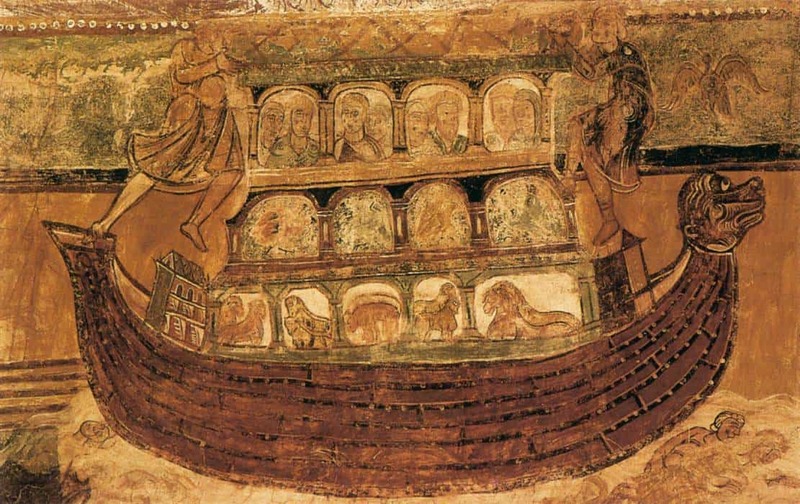 Noah would build a boat according to a specific design and that vessel would hold all that God chose to call and rescue from the judgment He determined. Where would Noah find the material for such a project? In the woods, that’s where. God sent Noah to the trees, to cull gopher wood. With this, Noah formed the boards, the beams, the rutter, and the rooms for the Ark. This takes us back to the beginnings of mankind. Adam was told to dress and keep the trees of the Garden. Following his Fall, Adam and his wife hid away among those very trees as the Voice of God sought them in the cool of the day. Noah was instructed to go back to the trees. Make an Ark. Make it of wood. Cover it, inside and out, with pitch. This last substance likely came from pine resin, boiled and painted upon the vessel to make it water tight. It was a big job. Notice that Noah was not given a deadline or even a timetable. He was called and told to build. That’s it. A man called to stand alone in his generation had a lot to do. And he did it. Noah’s work spoke for God. Peter makes reference to Noah as a “preacher of righteousness” during his days (see 2 Peter 2:5). Were there mockers and scoffers around him? I am sure there were. Those watching him could not understand. God was not in their thoughts. Many mornings Noah likely had to drag himself out of bed and to the work site. He had to discipline his mind to hold fast to the promise of God. Build, Noah did, day after day. He sawed the wood, drove the nails, made the rooms; he followed the plan given to him. It was simple, hard, unglamorous work stretched over years. Faithful, this man made the Ark ready. Trust and obey, that’s all he could do. There was no other way. Work, watch, wait – these words Noah kept in mind. Every now and then, he looked to the sky. I wonder how he felt at the sight of a cloud or two. One day animals started to show up. They, too, were moved by God, commanded by Him to come to the place of salvation. Noah welcomed all that God had sent – clean and unclean entered in to the rooms prepared for them. At last came the word came from the Lord: “After seven days, I wills send the rain.” The animals entered the Ark followed by Noah, his wife, his sons and their wives – eight people in all. “And the Lord shut him in” (Genesis 7:10-24). The waters poured down for 40 days and nights. The earth was soaked; its creatures drowned. Man’s sins brought judgment upon the world made for him. The story of this man is a revelation to us of how God sees and how God knows. Another age of great evil is coming, and we see the seeds of it now. Jesus spoke of this age in teaching His disciples about the time of the end. “But as the days of Noah were, so shall also the coming of the Son of man be” (Matthew 24:37). Just how bad will things get on the earth? As bad as things were in Noah’s time, Jesus said. This should come as no surprise. We see the direction of “civilization” and the road it is on. How are we to think? What should we expect? We should think with God and expect His promise to hold true. “Fear not little flock, it is the Father’s good pleasure to give you the Kingdom” (Luke 12:32). We are on the inside of the Ark, looking out. God called us. God saved us. God keeps us. We wait. We watch. We pray. We look to the sky. And, we work, building as “preachers of righteousness,” shut in as His people to reveal His glory.